Now that we are well into summer can I just say that it has been way, way, way too hot for me. Don’t get me wrong I am in no hurry to be shoveling snow nor do I want to part with my sandals, maxi dresses, or frozen drinks just yet, but this humidity is doing a number on me. Luckily my desire for a batch of homemade muffins out weighed heating up the kitchen a bit! 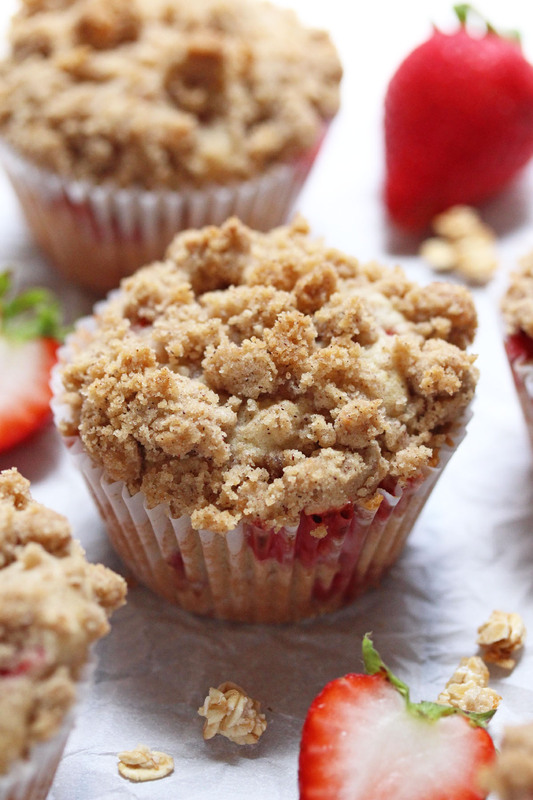 Which is a great thing because now I have this delicious recipe for strawberry granola muffins to share. Since fresh strawberries have been a constant in our house lately, it only seemed right to toss some in with the batter. The good thing about these muffins is the batter lends itself well to all sorts of mix-ins like lots and lots of crisp clusters of granola. For this batch I went with a simple store bought honey and oat mixture and because no muffin is quite complete with out a bit of something on the top I sprinkled these with a buttery granola crumb topping. These muffins are so good that just one bite will make you forget you ever had to turn on the oven! Now might be that time to add that these muffins pair really well with a tall glass of iced coffee, just throwing that out there. Preheat the oven to 400 degrees and line a muffin tin with paper liners. In a medium bowl whisk together the flour, brown sugar, cinnamon, and granola. Pour in the melted butter and using a fork or clean hands mix until combined and crumbly. Set aside. In a large bowl whisk together the flour, baking powder, baking soda, salt and cinnamon. Set aside. In the bowl of the electric mixer fitted with the paddle attachment add the butter, granulated sugar, and brown sugar. Cream on medium high until fluffy and pale in color. About 4 minutes. Add the flour mixture in three equal parts and the buttermilk in two equal parts alternating between the two. Stop the mixer to scrape down the bottom and sides of the bowl when necessary. You want to mix the batter until just combined. Make sure not to over mix. Gently fold in 1/2 of the strawberries, and 1 cup of granola.The batter will be thick and perfect for scooping! Bake the muffins at 400 degrees for 5 minutes. After five minutes reduce the heat to 350 degrees and bake for an additional 16-18 minutes or until a toothpick inserted into the center comes out clean. Allow the muffins to cool and enjoy!